Life on two wheels: iTravel, iBlog, iLike! 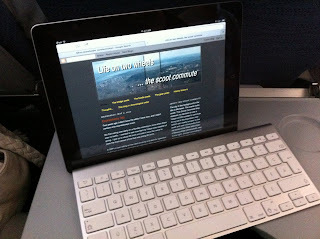 Finally I have found a digital travel solution that really works well in the confines of the airline economy seat. It's the Apple iPad with an Apple wireless keyboard. You can actually type in comfort, and without worrying that the thoughtless oaf in the seat in front of you will recline and crush your laptop screen. When you factor in the wonder of in-flight WIFI, priceless. When the flight attendant announced that our flight had WIFI, a ripple of oohs! and aahs! greeted the news. You have to ditch your laptop and try this. With the right combination of apps (think Pages, Goodreader, Penultimate, and Dropbox) you can be productive with a fraction of the weight and bulk. Hence even if inflight WIFI will be available, I will stick to my Kindle and iPod and pretend it doesn't exist. I like to do video editing so I have a small computer that looks like a netbook in size 11.6", but is a full computer, Win7, 4g Ram nearly full keyboard, etc. I am running Premier Elements and also Photoshop. Plus I need a computer to transfer video to my external drive. I didn't know they had inflight WiFi, anyway I have a Kindle App on my iPhone and I just read. Pretty sneaky using the iPad and keyboard combination. I can see how that would be great for the tiny tables on the planes. We have an older Macbook and usually travel with it and the iPod (one for each of us) and we can load our photos off our camera onto the laptop, still haven't got the s-card reader to do it on the iPad. iPad and Blogpress. nothing else needed. I'm really interested in using iPads with keyboards. I currently teach in a laptop program where all the kids have MacBooks but they are starting to get long in the tooth and in the next year or two will have to be replaced. iPads with keyboards may just fit the bill as they are a heckuva lot cheaper than laptops and i think that they can do most things a laptop can. Your experience? Dave, iPads are showing up in more and more schools, in some cases here in private high schools, they are being used as a way to reduce the cost of textbooks. An iPad is similar to, but different from a computer. Some things iPads can't do, such as run Adobe Flash content. Some applications don't exist for the iPad, such as the Microsoft Office Suite (Word, PowerPoint, Excel, etc.). There are other things that the iPad supports that most computers don't, principally the features made possible by the touch screen (growing, shrinking, moving and rotating images, writing in long hand on the screen). As a result, annotating documents that are in Adobe PDF with iPad apps like iAnnotate or Goodreader is much more effective than on a computer. Even if you can't yet have Word or PowerPoint or Excel, there are Apple equivalents like Pages, Numbers and Keynote that provide basic functionality, or in cases like Keynote arguably better functionality, than their MS counteparts. The huge pluses as you pointed out are cost, portability in size and weight (particularly important for younger students, and particularly if the iPad displaces textbooks). Battery life is another huge plus, no need for power outlets for each student to support laptop batteries since an iPad will happily run all day long on a night long charge. I should add that the built in camera could make student projects much easier to do in some disciplines. All in all, a brilliant tool for children.